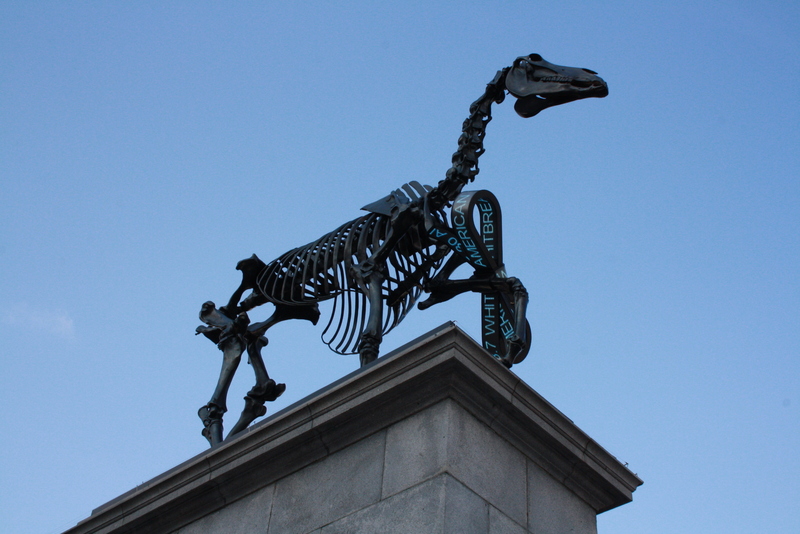 I was passing through Trafalgar Square today, and got a few photos of the newest work on the fourth plinth – Hans Haacke’s Gift Horse. When I first saw it I thought it was quite impressive, at least aesthetically. The skeletal form cuts a bold figure against the sky from across the square, and plays on the traditional man-and-horse statue that stands opposite (but in a better way than the last equine statue on the plinth, which by all accounts was a bit naff). What’s interesting about the work is this: there’s an electronic ticker on the horse’s front hoof, which shows the latest prices on the London stock exchange. Bit political for a government-commissioned artwork, I thought, and not knowing anything of the artist assumed it couldn’t possibly be touting some apocalyptic message about austerity and “the bankers” being a harbinger of the end of days. Surely it signified London’s status as an economic powerhouse, rooted in an age-old tradition, etc. etc. Well, it turns out the artist and Boris Johnson have had something of a difference of opinion on what the work really means – with some expressing surprise that the Mayor gave it the go-ahead, given the artist’s record of politically provocative work. Then again, Boris has made a name for himself through half-accidental gaffes and eschewing the party-line correctness of the typical politician, so maybe this is somehow forms a small, intricate part of his master plan. Who knows. It’s good that there’s something up on the plinth that makes a statement (it’s predecessor was a giant blue cockerel, *chortle*), but the more I think about it the more the stock exchange ticker seems a bit, well… crude. My favourite plinth piece by far is still Marc Quinn’s Alison Lapper Pregnant which sat there from 2005-2007 – political in its own way, I suppose, but personal too. Regardless of your decision, you run a great blog here and I’ll be sure to look out for your future exhibition writing. Brilliant! Please do send us a Facebook message so we can discuss name crediting and future content. If you’d prefer email, message us at info@seroword.com. Thank you.